Designed and made in the Philippines, these are the latest design in Full Contact Eskrima Kali Arnis arm pads. Designed for high impact contact to the arms with Velcro fasteners for a compact adjustable fitting for the user. 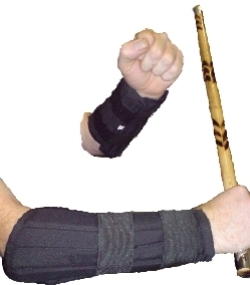 Ideal for any Eskrima Kali Arnis contact sparring or training. Also ideal for other weapons contact sports such as Kendo or Nunchuka sparring.